Rain did indeed stop play in Grange and sadly there were no let up in the downpour for us Vagabonds to show. We huddled under the veranda of a fine coffee shop sipping for most of the morning. We spent our time writing our blogs for your viewing and passing time with the myriad of moist passers bye. I have lost count of how many times i have explained to curios curb crawling shoppers what Dolly is and how we transform her into our show. No sooner has one person had the story and moved off promising to try and find the show later that evening than the next eager punter was over to hear the news. Two ladies having a coffee break from the novelty shop chatted with us for a while before returning later with a gift of chocolate ducks from their store, and we also talked with a very interesting gentleman called Gerald a recent widower who had a vast knowledge of Music Hall and variety turns and had watched first hand most of the performers i have only studied and be influenced by. Laurel and Hardy, Max Miller, Frank Randal, Chaplin and many more have performed for him down the years. In fact he was such a regular visitor to the halls that he had made his way through three of Wilson and Kepple‘s Bettys. Shortly it was time to shunt Dolly to the station, not for the train as the line was up heading east but for the Evening Mail van waiting to whisk us beyond the viaduct and Milnthorpe. We had received news of the train cancelations a few weeks in advance of our departure and desperate as we are to avoid adding a carbon footprint to our adventures we had contacted The Mail to request a lift as they would inevitable be heading that way on the daily run to drop off their learned journal. We had written to the railway company too and asked if we could push our Dolly across the bridge on foot as the trains were all retired to their sheds. Apparently this would all be to much trouble and to the detriment of health and safety regulations, even though we had offered to wear the lime coloured hi visibility costume common to work blokes by the side of the line. Sadly still no! A missed opportunity and a great shame as it will probably be the last offer they will ever receive to have a good honest puppet show push across it’s viaduct. Thankfully The Mail had room in the back of the Milnthorpe van. Soon we were whirring along the A590 and shortly outside the local shop town. “Ill wait while you restock on wine and run you down to Beetham” said Clive our courier. But we thanked him and explained that we wanted to push old Dolly as much of our way as possible. We said our goodbyes and pushed off into the south and Beetham’s Heron Corn Mill. 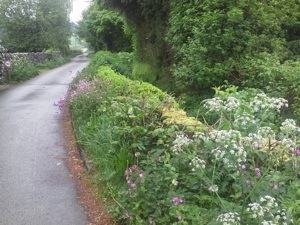 The lane that leads to the incredible 11th century mill is of great beauty. A slow running river teams with ducks and leaping fish as the scent of wild garlic burns your nostrils. 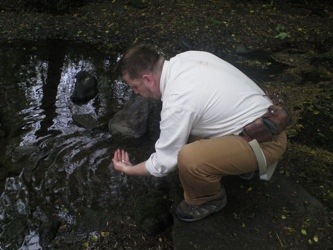 Already butter and dragon flys were dancing along the top of the water and we stopped to film and wash the back of our necks in the cool stream. Pushing into the barn adjacent to the mill itself we set up for the show indoors as the weather was again on the turn. We had decided during the moist night before that we were going to have to invest in better tents and i reflected on this lessons in false economy as Audrey the director of the Mill drove me to a local camping store to rectify our mistake. I bought us two more sightly heavier but better before returning in time to set our props for the evenings show. We performed to a small audience of about 30 and with only two children. We had a fine bloke called Graham join us all the way from Bowes in the northern borders and having read of our exploits and freezing nights under the canvas via our blogging had not only driven many miles to see the show but also brought us a gift of his home made whisky.Very nice to thank you! A gaggle of ladies holidaying locally had also found out about our show in the nick of time and bustled in to join us shortly after our first routine. Our show is designed for a family audience and missed a few more children present but it was a pleasant enough evening with a hat of £30.17 and a bottle of hard liquor. We took our collection to the local pub and had a fine meal from our heavy hat. My wife George and son Alfie decided to stay over and once again full to burst we walked back through the lovely little village towards the Mill and the barn where we were to bed down. Along the way the sky suddenly flashed. So tight in the woodland and unlike at the seaside we had no advantage of view over the storm and it was soon upon us. Violent rain lashed down and we were quickly soaked. The lighting flashed and lit deep into the woodlands and for brief second. I thought this to be brilliant but my boy of four years old was less impressed and so we darted quickly back into the bar. Tramps, showman and vagabonds have forever sheltered in barns and i was romantically pleased that we were no exception. Admittedly our barn came with underfloor heating, tea, coffee a fireplace and a wall mounted projection screen offering internet cartoons for my boy to rest back and drift off to. My companion Lord Gregg, My wife George and myself sat around the fire drying our cloths and drinking wine, whisky and hot chocolate and very nice too. It was lovely to sleep on a soft bed with George again even if it did deflate throughout the night, and we woke late around 8.00 with my boy Alfie leaping into our bed for morning cuddles. All the same it was time to pack and prepare for our next big push. This was to prove a challenge. Seven miles, strong hills and a full beer garden audience waiting. The journey so far had been a joy. It was to continue to be so as it was soon to get all very Wilkinson.